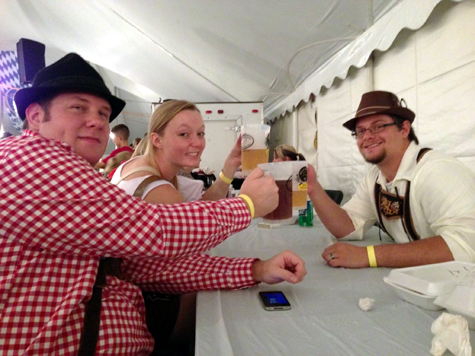 This is the second year that I have attended the Plano Oktoberfest and this year was as fun as last year. Sadly, I had to drink less since I was the designated driver but that was because my own Oktoberfest was the next day and I wanted to make sure I would actually wake up in time to finish setting up and get the kegs; but enough about that, on to the Plano Oktoberfest. 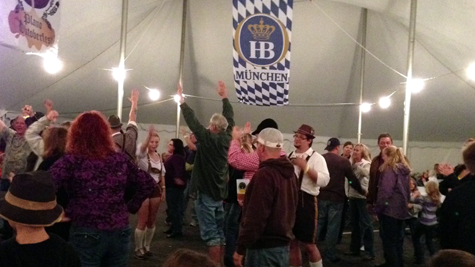 Just like last year, the Plano Oktoberfest was held in Downtown Plano near the train station under the big tent. 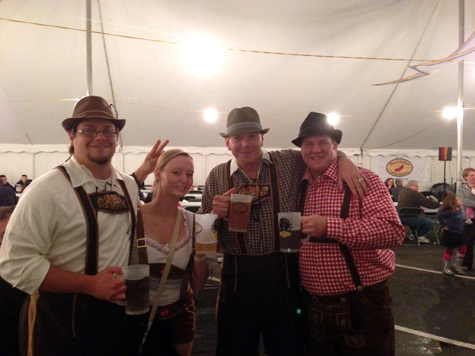 They also had one liter mugs to drink from and the food was catered by the Wurst Kitchen. A new addition was the beer. This year they offered beer from Hacker-Pschorr instead of Two Brothers. While I like Two Brothers a lot, I was very happy to see Hacker-Pschorr Oktoberfest on tap. The crowd was not as big as last year; then again, it was a Friday night. The Happy Wanders provided the entertainment for the evening. They were a fun little three piece band that played a number of polkas and other German favorites. They were also on the ball playing Ein Prosit periodically throughout the evening. 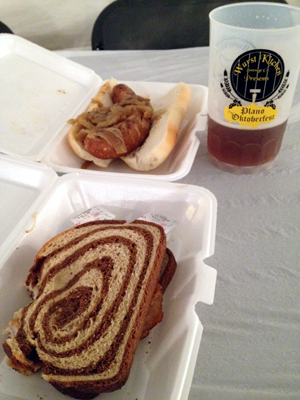 Like I said before, the food was once again provided by the Wurst Kitchen in Plano. I opted for the kicker bratwurst and schnitzel sandwich. Sound familiar? That is the same meal I had last year. I would have got the regular bratwurst but I had 100 of them ordered for my own party. After eating, my friends and I enjoyed the general conversation that you have at your table but then it was time to get on the dance floor. This year we were able to join in the chicken dance competition. I’m not a big fan of the chicken dance and it isn’t played at Oktoberfest in Munich but for some reason America loves it. I will give it one thing and that is it makes a lot of people get up and out dancing and it does increase the energy in the place. They had competitions for kids and adults. My friend’s brother-in-law won one of four chicken dance trophies that are given to the winners. The whole evening was a lot of fun but it did seem to die quickly. The Happy Wanders ended their set around 10:00pm and the tent seemed to be mostly empty. We also had to leave at that time because we had more Oktoberfest to be had the next day at my own party; more about that in another post. The Plano Oktoberfest is still one of my favorites in the area but it has dropped a few spots but that is mainly due to it being an hour from my house. Also, I was really looking forward to seeing the Johnny Wagner Band again but they were playing Saturday night.